So, as the departure date looms for the beginning of the expedition with Chester Zoo, the packing has begun! But what should I take for two weeks of travelling when you have to carry all of your own kit? Lightweight is a priority, alongside items I can wash, dry and don’t have to iron. I’ve handpicked my key pieces which are lightweight, packable, and full of technology – making travelling that little bit easier (eg. Drying loops on clothing so you can hang them to dry anywhere – genius!) So for top tips on what to pack for an adventure , you’ve come to the right place! This jacket is cleverly designed so it folds into its own pocket, making a pillow – it is my perfect travel companion. I chose this jacket as it is really warm as it is filled with synthetic fibres, so will keep me snug. It is really lightweight too at 375g to be precise and can fit in the bottom of my hand luggage with ease. Compresslite III Hooded Jacket – it folds into it’s own pillow! The Forrester Jacket is packed full of features, ready for the jungle. It is waterproof and breathable (a must!) thanks to the AquaDry Membrane which means that it will still be breathable in the heaviest of downpours! The 8 pockets are perfect for all of my camera gear. The beauty of this jacket is that it also features NosiLife technology so it will keep biting insects and mosquitoes at bay. I love this coat – I’m planning to take this one with me everywhere! It only weighs 410g and has a hood to keep me protected in even the heaviest of downpours! This gilet comes equipt with 18 handy pockets, perfect for my notepad, pens, GPS and camera bits and bobs! The material offers UPF 50+ sun protection and is complete with a Zip n Clip fastening so I can keep valuables safe. The NosiLife Allegra Gilet with it’s 18 pockets! 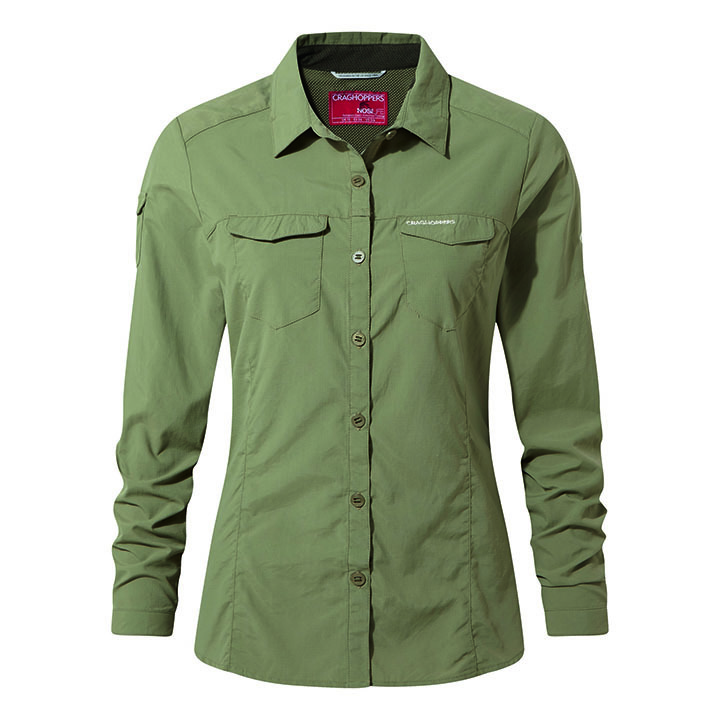 The NosiLife Adventure shirt is a best-seller and it is easy to see why. The lightweight shirt has NosiLife technology, keeping bugs at bay and SolarShield technology for guarding against the sun. The fabric is quick drying too which is a big bonus! I will definitely need this to stay cool and dry in the humid rainforest, especially walking several hours every day. And the 4 pockets, including an inside zipped one, are perfect to keep my belongings safe! This is a smart stretch midlayer in navy which will look really smart and will work from the plane to the camp. Made from comfy cotton elastane, it features two handy zipped pockets and built in UPF 40+ sun protection and NosiLife technology. The NosiLife Erin II is one of my favourite tops! The fabric is quite thick, so it offers some great protection. It is great for casual wear in the city or wearing around camp when it is cooler, the Erin II will keep me off the menu from the midges too, thanks to NosiLife! The feel of this top is really premium, so I’m saving this to wear on the flight. The soft material is really warm, so perfect for travelling as it can get a bit chilly on the plane! I don’t think I will wear this in the daytime, but definitely when it’s cooler and I need to look a bit smarter. This is my ultimate favourite – a lightweight fleece that’s made from recycled plastic bottles. It will keep me warm in the evening if the temperature should drop. The fleece is also super soft (considering it’s made from plastic bottles!) and packs down nicely to not take up too much room in your bag. I’m taking a Kiwi Pro 30L because this spacious backpack is really light with all of the handy compartments I’ll need. I love the black because it looks smart and the adjustable straps will ensure it fits me well if I’m to be wearing it hours every day! I particularly like the handy pocket at the top which is great for all of the small things I need to keep handy. The large pocket at the back is great for laptops, books and spare clothing! The camo and blue version too are striking colours. These are an absolute must if you want to make sure you always have a spare pair of dry clothes. Even if your bag falls into a river… it will ensure you have at least one set of dry clothes! I’ve taken a range of sizes from 2L to 40L– some to keep in my tent to make sure my kit stays dry and some smaller ones for socks! I also pack one into my backpack for when I’m out and about for medicine, to make sure that they are safe and dry if we are ever caught out in a storm. (I must protect those anti-malarial tablets because there is definitely not a pharmacy around the corner!). The comfortable fabric and smart look of the Winter Trekking makes them the perfect trouser for a long-haul flight. The stretchy fabric makes you feel really comfy, as they mould to your body shape too. The black is really flattering and feel like a second skin instead of feeling restrictive when you’ve sat in your plane seats for hours! The Luna leggings are also amazingly comfortable, in NosiLife fabric which helps guard from mosquitoes and other critters! I will use them for walking around camp at dusk and dawn, and to sleep in too! Kiwi Pro Trouser – The comfy walking trouser which I plan to wear everyday! I’ve taken a couple of pairs of the Kiwi Pro trousers as they have built in SolarShield and are stretchy so fit me really well. They also roll up neatly so I can fit everything in to my bag. The handy zip–off feature means I can pack shorts and trousers in one! The fabric also means they won’t crease so they’re perfect for washing, packing and stuffing into suitcases whilst always looking smart. I’m really excited to try these out! NosiLife socks feel like a hug on your feet – (I’ve owned some before this trip!) and are made mostly from cotton. There are so many colours to choose from. I went for the blue, but there are also green, pink and grey and stripy versions too. NosiLife Outback Hat – The hat that protects your head …and your hair! I’ve chosen this classic hat because it will keep me protected from the sun whilst providing ample shade! I’ve also got long blonde hair that’s prone to snagging on low branches so I’m hoping this will keep me protected. The Khaki colour is perfect for the jungle as it won’t frighten off the animals whilst we are researching. I need a camera that won’t be phased by humidity or the accidental drop on hard ground. I therefore chose the Olympus T5 Tough for it’s great spec with features such a 12 megapixel camera, slow motion capabilities and it’s microscope setting for close ups. The great zoom lens will let me capture animals who are higher up in the canopy and the camera has in-built picture editing too. With limited electricity in the middle of the forest, our camp will solely rely on a generator, so charging is scarce, so I’ve taken an extra battery, just in case, as I will be taking pictures and video 24/7! There’s also built in wifi and OI. Share capability, allowing you to track where you took each image. Genius! I’ve been told we will have electricity for 2 hours a day, so I’ll need a top spec phone with an amazing battery. I’ve chosen the Land Rover Adventure phone because it’s rugged and tough appearance is exactly what I will need when I’m out and about in the jungle. The phone also has an attachable battery pack and built in GPS which you can clip on and off. I can’t wait to use this phone to see how it performs in the jungle.